Perfectly situated in the centre of Haadrin and roughly 1 minute walk form the Full Moon Party and just a little bit further to the other 2 amazing beaches in the area. There a lots of shops, ATM's, banks, bars, hairdressers, tattooists, massages, restaurants and much more within no more than a 5 minute walk to anything in Haadrin, plus there is also a pier 30 seconds walk from th hostel which has 4 boats daily to Koh Samui daily. Location is everything and Haadrin is really the only place to be at Full Moon. This is where you will spend most of your time, our newly refurbished bar and restaurant is a great place to socialise. 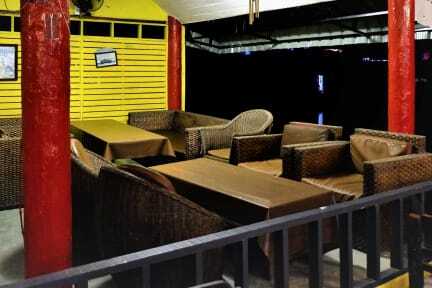 It's huge and stacked out with comfy chairs and sofas so you can chill, relax, eat and drink with your new friends. We constantly play killer drinking games but for those who just want to sit back and soak up the atmosphere while getting in the party mood there is more than enough room for everyone to feel at home. However things tend to get out of hand pretty quickly so don't be surprised if you plan just to by yourself for a little while nursing last nights hangover only to find you get dragged into a game of beer pong or ring of fire within a few seconds of sitting down. We also have a free pool table and massive big screen TV with netflix and live sport and movies galore. The atmosphere tends to be pretty chill during the day but come night time we have a warm up party each night before each event over full moon so our bar trans-forms into a mini nightclub, cheap strong buckets plus a few vodka joss shots will get you in the mood along with an abundance of free uv body paint which will get you in the party spirit. There will be great tunes blasting from the speakers and plenty of tables to dance on, we encourage you to do all of this!!! Like everywhere on Koh Phangan we have a minimum stay during full moon, however all other dates during the month including Half Moon you can now stay with us with no minimum stay required and our bar is great for pre-gaming before all the nightly parties such as HALF MOON, WATERFALL, EDEN, GUYS BAR, LOST PARADISE, LIGHTHOUSE AND LOI LAY. Most of you are coming to Koh Phangan to party and you wont be disappointed, but should you wish to take a break from the many crazy party events then fear not as Koh Phangan is home to one of the worlds largest Yoga communities and away from the parties you will find some of Thailand's most stunning beaches, epic viewpoints, quirky night markets and some of the best tasting vegan food you are likely to find, so if your looking to chill then haadrin is a great place to be when visiting the island when its not Full Moon as it super quiet and relaxed but you will still have the option to party should you feel in the spirit after a relaxing day at one of the many great areas the island has to offer and we at Jaya will happily give you a detailed run down of all the places you might want to hit up depending on what your looking for. We RECOMMEND that you arrive four nights before the Full Moon Party, as it’s a week-long festival rather than a single night of fun. A good majority of people also believe that the parties leading up to the main event are even better than the Full Moon party itself! Allow yourself to fully enjoy the full moon by NOT checking out the morning after. The party goes until after sunrise, followed by an many after parties!!. We provide towels, lockers, filtered drinking water, however you will need to provide your own padlock for the lockers. All common areas and lockers under CCTV surveillance for the security of our guests and their belongings. We operate a travel and tour service also so anything you wish to do we can happily arrange for you with tickets at a discounted rate for our guests and pick up from the hostel. Please contact us prior to your stay via our facebook page or by email/phone for information and great discounts on any number of the tours available to choose from on Koh Phangan. We offer the best discounts for Angthong National Marine Park if that is something you are looking to do during your time on this side of thailand. And of course so you can stay in touch with you friends there is free Wifi, but we suggest you spend most of your time making friends and having fun. Really nice hostel for chill and for party. Staff is really friendly and the location is perfect. Stayed here with new year and it was a awesome party. After the new year we stayed here when the cyclone was coming over. Felt me really safe and i had a kind of family feelings. For sure that i come back here! Echt een party hostel tijdens de Full Moon party. Erg gezellig en het restaurant is niet duur en lekker. Kamer was simpel maar prima. Personeel is top en helpt je overal mee. Ze kunnen allemaal prima Engels. Verwacht niet teveel, of eigenlijks niks van luxe! Echt een party hostel! Met 20 man op de kamer, vieze douche, maar dit alles geeft niks omdat het voor de fullmoonparty is! En dat maakt alles weer goed!